Honfleur is a pretty medieval coastal town on the Normandy coast at the mouth of the river Seine. At the centre of the town is the old harbour (vieux bassin) which is surrounded by a large selection of shops, cafes, restaurants, museums and art galleries. 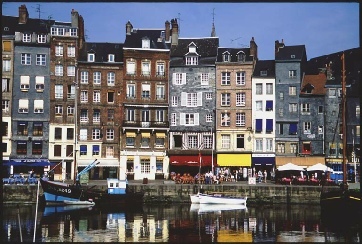 Honfleur has a strong connection with the impressionist artists. 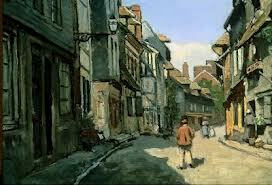 The picture on the left was painted by Claude Monet and is entitled ‘Rue de la Bavole’. There is a plaque about 100 metres from the cottages to show where it was painted and you can still recognise most of the buildings! 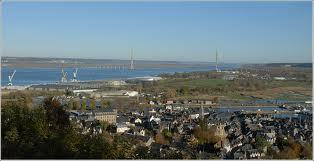 There are many attractive walks around the town, in the surrounding countryside and along the sandy beach. The chapel of Notre-Dame de Grace has panoramic views across the town. Rouen. City with its medieval centre, cathedral and links with Joan of Arc. Normandy Beaches and Pegasus Bridge. Many museums giving details about the D Day landings. Deauville/Trouville. Coastal town famous for its film festival, beaches and designer shops. Etretat. A small picturesque coastal town famous for its cliffs. Falaise. The birth place of William the Conquerer with its magnificent castle. Giverny. Claude Monet’s house and gardens. 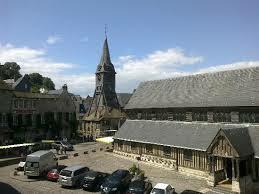 St Catherine’s church with it’s separate bell tower is one of the oldest wooden churches in France. There are many other medieval buildings, museums and parks to visit in the town. 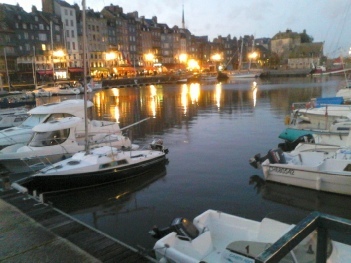 A view of the harbour at dusk with the lights from the restaurants.